Given my current mood, in which my love of Brahms continues to grow each day until, I anticipate, some kind of explosion will be brought about, it would have been impossible for me not to choose at least some Brahms here. I’ve gone for the recording of his chamber music for viola – the op. 120 sonatas and the op. 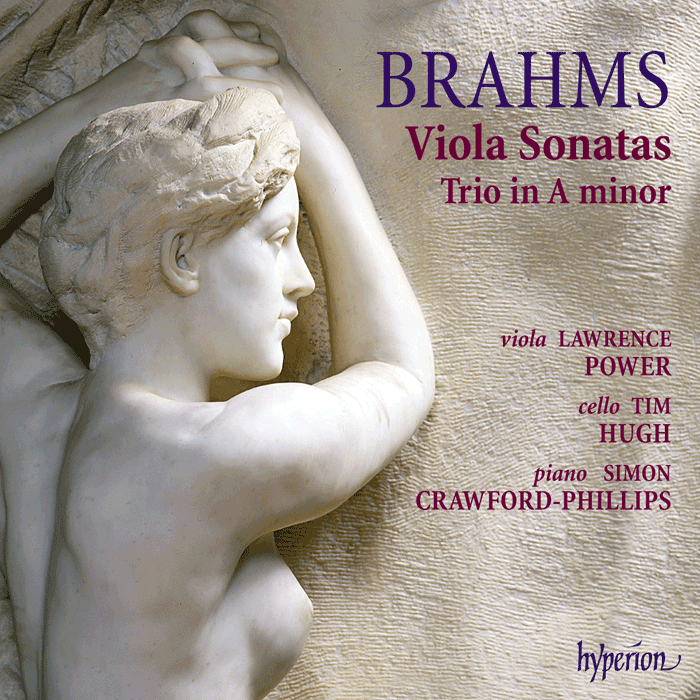 114 trio – by Lawrence Power (viola), Simon Crawford-Phillips (piano) and Tim Hugh (cello). These three works are among Brahms’ latest utterances, each one inspired by his acquaintance of the clarinettist Richard Mühlfeld. It’s a shame there are no recordings of Mühlfeld that survive: he died in 1907 at the age of 51. Brahms swiftly made new arrangements of the pieces substituting viola for clarinet, and the rest is history. I have a special affection for the viola, which undoubtedly arises in part from my being a trombonist. As solo instruments they are usually neglected in favour of the violin and cello, the trumpet and horn. Neither instrument gets the tune very often either, but at least in the orchestra, though I don’t wish to grumble unduly, the violas get to play a bit. I remember going to an orchestral rehearsal once and finding the trombones had only one note to play, which fell on the final beat of the piece. We were permitted to leave. But I digress from my point, which was meant to be that for this bridesmaid of instruments to be given the occasional opportunity to get married (taking this metaphor a little too far now) is a cause for celebration. The point has been made more eloquently by others that, listening to these performances, there is not the slightest suggestion that they might originally have been written for another instrument. Lawrence Power is a persuasive and poetic soloist. The first sonata, various Ohrwürmer from which have been going around my head for what seems like days, is a favourite. Its third movement, whose kinetic joy recalls the finale of the great Franck sonata (and prompts me to wonder whether Brahms knew the piece) and which Tovey identified as “the most deliciously Viennese of all Brahms’s works”, is played with an irresistible verve. Power’s gentle, teasing portamenti are quite joyous. H.C. Colles wrote in 1933 that the sonatas lose a great deal when not played on the clarinet, a view also widely held by clarinettists. One wishes he could have heard Power and Crawford-Phillips. What the sonatas may necessarily lose in mellowness of tone they regain here in intimacy from the less forthright character of the viola. In the trio, though, I do sometimes miss the autumnal shades of the clarinet against the cello and piano. Which is not to say that the three musicians here fail to give it a compelling reading – quite the opposite. Duncan Druce, writing in Gramophone, rightly praises it as “a very fine performance, of exceptional expressive range, from extreme delicacy to thrilling power.” For those who can’t bear not to hear the clarinet in these pieces (and what unreasonable people you are, I must say), Thea King’s intelligent performances of them are available from Hyperion’s budget label Helios, and also in this box set of Brahms’ complete chamber music, which also includes the CD under discussion (and may be bought somewhat more cheaply than from the Hyperion website at present).